Dustin, Jeana and Bayler Hurlbut stand next to their newly painted show barn on their ranch near Raymond, S.D. As CAB celebrates its 40th year, the people behind the name are joining in by painting the logo on 40 barns on Angus ranches across the country. "To celebrate 40 years, we really wanted to do something big, so we went as big as a barn," said Nicole Erceg, CAB producer communications specialist. "We thought painting barns would be a fun way to celebrate with the people who supply our brand. Every pound of CAB starts on a ranch, and with this celebratory event, we are able to bridge the gap between producers and consumers with this throwback to old school marketing." A record-breaking 1.12 billion pounds of CAB product sold in 2017, showing how popular the iconic brand really is. With half of the 40 barns painted, the barn paintings have brought together ranching families, food bloggers, food service suppliers, packers and essentially every segment of the industry from pasture to plate to celebrate. "Getting these folks together to sit down for a meal together has been really great," said Erceg. "We've had food bloggers who not only got to spend a day on a ranch during the barn painting, but they also went on to share the information they learned with their followers." The 40 barns were selected from nominations, and the individual operations span from coast to coast. "We really looked for ranchers who are true ambassadors of the brand," said Erceg. "They might have been past members of the board or someone who has been really active and supportive of the brand. If they had a great barn and a passion for the CAB brand, that is how we made our selection." One of the selected ranches was the Interstate Angus Ranch, owned by Robert Boehm. Located just outside of Mandan, North Dakota, Boehm raises Angus cattle and sells bulls privately off the ranch. Additionally, he operates Roby's Supper Club, a steakhouse run right on the ranch where Boehm's Angus cattle roam. "The barn is 100 yards from the Club," said Boehm, who has been serving CAB steaks and burgers to local patrons for 17 years. "Our customers will be able to enjoy viewing the CAB logo painted on the barn while they dine on CAB steaks and burgers in our restaurant." 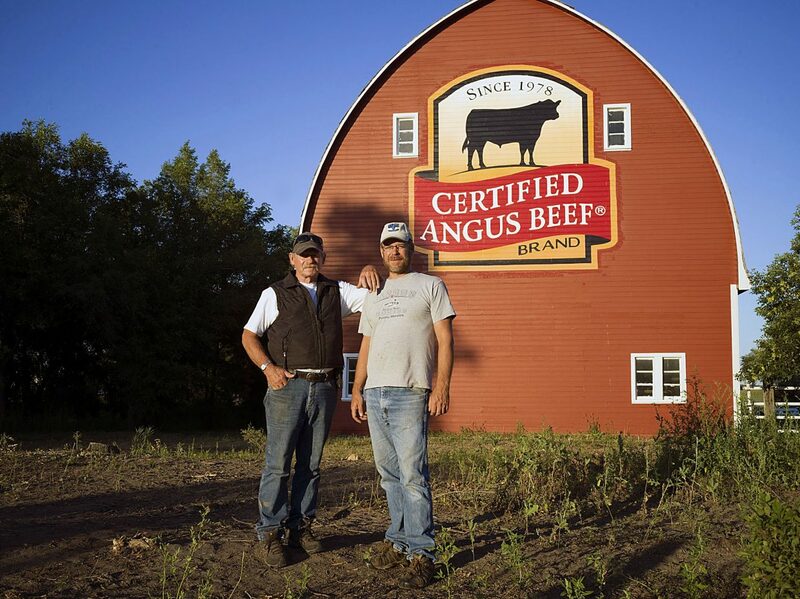 Boehm saw an article in the Angus Journal about CAB's barn branding project and applied to be one of the 40 ranches. "It's an honor to be selected as one of the 40 to get a CAB logo on my barn," said Boehm. "It's truly a once-in-a-lifetime opportunity, and I feel very fortunate to have that logo displayed on my ranch. I raise Angus cattle and serve 100 percent CAB product in my restaurant. It's a great product that is always tender and has plenty of marbling and flavor. CAB ensures a high-quality eating experience, and if I couldn't serve CAB product in my restaurant, I don't think I would serve beef at all." 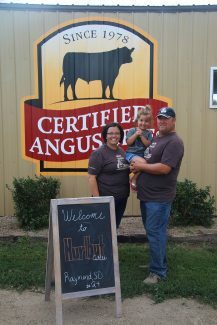 Boehm's #BrandtheBarn celebration took place on July 23. Visitors enjoyed a CAB meal while artist Troy Freeman, of Springfield, Ill., painted the mural. Freeman is a book illustrator, graphic designer and painter who specializes in large-scale paintings. "It takes three days to paint each barn," said Erceg. "The first day is basically prep and outlining the logo, and the next two days are spent painting. Troy is a phenomenal painter and artist, but we have found he's a rainmaker, too. We have visited several different parts that have been suffering from drought, and he's brought rain with him. In Texas, one ranch hadn't had rain in 175 days, but the day he showed up to paint the barn, they received a half-inch. It's made his job a challenge, but it was such a welcome relief for these folks." As part of the celebrations, CAB staff members help to host the #BrandtheBarn events, and the ranchers provide the canvas for the logo. "It's an honor that these producers want to put our brand on the side of their barns," said Erceg. "A barn is such a centerpiece of a ranch, so it's amazing they choose to put CAB front and center on their barns." In South Dakota, two barns now have CAB logos. On July 29, Freeman painted the brand on a barn at Hadrick Family Feedlot near Faulkton, and on July 26, he stopped at Hurlbut Cattle near Raymond. 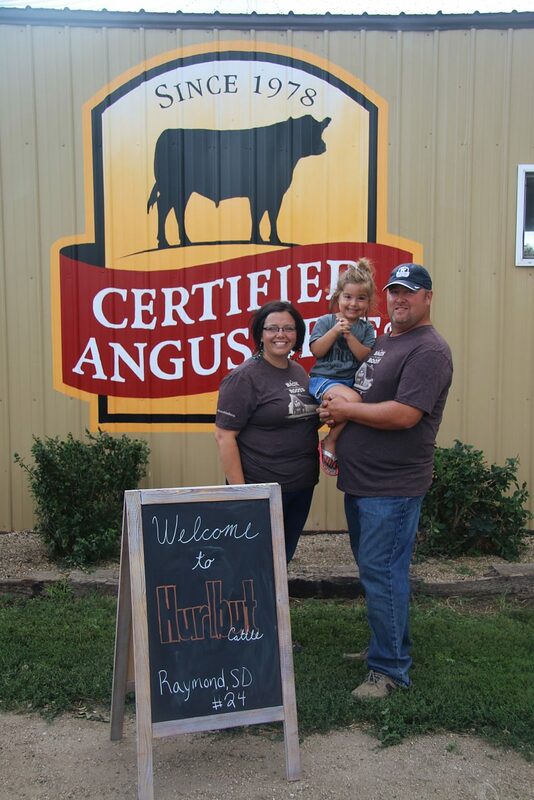 "We had nearly 60 people at our event last week," said Jeana Hurlbut, owner of Hurlbut Cattle. "Dakota Butcher served CAB brisket sandwiches while we watched the paint dry. It's such an honor to be recognized by CAB and be part of their 40th anniversary celebration. Our family is celebrating 75 years of raising Angus cattle, so it was really special to be part of this as we recognize this milestone in our family's ranching history." The Hurlbut's opted to put the logo on a five-year old metal show barn rather than the old red historical barn on the ranch. "We had contemplated putting it on the original barn on the place, but we wanted to make sure the barn was around for awhile," she said. "Troy uses a special paint that should last for 30 years, so it's exciting to know these logos will be enjoyed for decades to come," added Erceg. The #BrandtheBarn celebrations will conclude in October with a final barn painting to be held in Woster, home of CAB headquarters. To follow along and to learn more about the individual ranches, visit http://www.certifiedangusbeef.com/brandthebarn/.